Paper prototyping is a great way to generate lots of ideas at the early stage of a project. Bring the idea into reality by drawing it and it doesn’t matter how good it is. A picture paints a thousand words. When you see it take form you can understand it, talk about it with your team, test it with users and iterate it. You can also throw ideas away. Paper is much easier to screw up and chuck (recycle) than something digital. Its also cheap and quick. Sketch, glue, label or stick to make what you need to bring the idea into reality. Be creative. 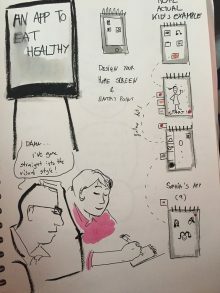 I saw a great prototype technique at UXBristol 2016 (2018 has sold out already and I wasn’t quick enough for a ticket, boo) by Sandra Gonzalez, Head of UX at JUST EAT and founder of UX for Change. She developed it while prototyping with kids in educational settings and its just as powerful in other settings. In just 45 minutes you create the prototype, test it, iterate and test it again. I gave a workshop on it today and had such positive feedback I though I’d share it here. if you have time you can have a show and tell of ideas and even vote for the best ones to take forward to a digital prototype.